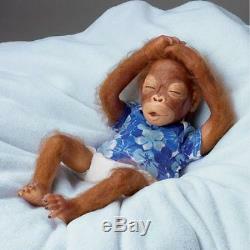 Baby Sekou Ashton Drake Baby Orangutan Doll by Simon Laurens 16 Inches. Echoing the playful expressiveness and beauty of a real-life newborn orangutan, Baby Sekou is a 16-inch So Truly Real® simian sweetheart you can cradle in your arms thanks to the unique artistry of master sculptor Simon Laurens! Baby Sekou is crafted of RealTouch® vinyl to re-create every realistic detail, right down to the folds and creases on the bottoms of each tiny foot, with a soft body for many posing options. Little wisps of hair, applied by hand, add to the incredible realism, as do those gentle eyes with such long lashes. Baby Sekou arrives ready to be pampered in a cute tee-shirt and diaper. This sweet-faced baby orangutan is handcrafted in RealTouch vinyl to capture all the lifelike folds and creases in hands and feet, then lovingly hand-painted. Little wisps of baby hair, applied by hand, add to the realism of this adorable orangutan doll. Baby Sekou arrives ready to be pampered in a cute tee shirt and a diaper. Measures 16 L; 40.6 cm L. Comes with Certificate of Authenticity. We stock over 100 different Ashton Drake Dolls. Due to their high turn around rate, they may not always be listed on here. If you are looking for a doll you do not see listed, please send us a message and we will set up the listing for you. Also, if you would like us to send you actual photos of the doll prior to ordering, please send us a message and we will. Our products are stored in a smoke free temperature controlled environment. The item "Baby Sekou Ashton Drake Baby Orangutan Doll by Simon Laurens 16 Inches" is in sale since Tuesday, April 28, 2015. This item is in the category "Dolls & Bears\Dolls\By Brand, Company, Character\Ashton Drake\So Truly Real". The seller is "itsirresistables" and is located in Rockford, Illinois. This item can be shipped worldwide.